pH/mV/Conductivity/TDS/Salt/Temp 7200 | Electronics India - Manufacturer, Supplier and Exporter of Analytical, Scientific Laboratory and Pharmaceautical Instruments in India. 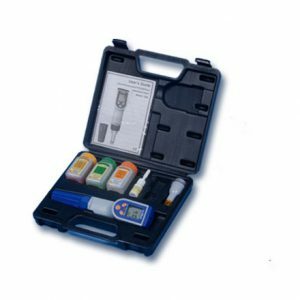 pH/Conductivity/TDS/Salt/Temp Waterproof Tester – 7200 is a microprocessor based tester used to determine pH, mV, Temperature, Conductivity, TDS and Salts in a liquid. This tester has wide applications in agriculture, anti-freeze recycling, aquarium, boiler, chemical industry, cooling tower, drinking water, fish farming, food industry, garden husbandry, hydroponics, laboratory usage, plating industry, swimming pool & spa, water treatment etc. It has rugged design for field use. It floats on water. It has Automatic Temperature Compensation (ATC) and is degree ºC/ºF switchable. It displays Maximum/Minimum value and data hold on large LCD display. It has low battery and consumption indicator along with auto shut off after 10 minutes of non use.